Siri, Google Home, Alexa and other voice-activated assistants are examples of technology that uses verbal input rather than typed to search for information. It took some time for this technology to reach the mainstream, but now it’s almost as natural to ask your smartphone a question as it is to type it. The search engine optimization you did for text queries doesn’t automatically translate to the voice world. 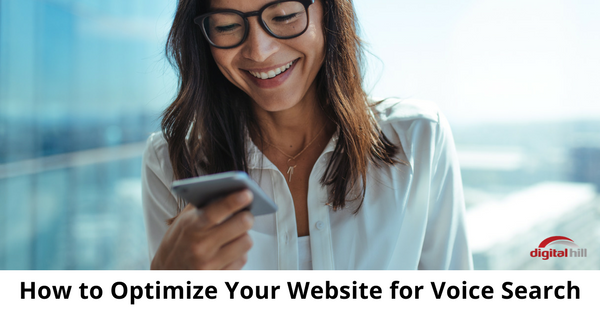 You need to adjust your website to attract voice search users. Improve the probability of showing up in mobile search results and future-proof your site for voice-activated devices. When a person types a question into a search box, they usually shorten the question down to a few important words. That doesn’t happen when they’re talking. Instead, they use conversational phrases and questions to communicate what they’re looking for. Start focusing on natural language phrases. When in doubt, say it out loud to see if it sounds correct. Another way to get more natural language content on your site for voice search is to create FAQs. Since this question and answer format is similar to the way someone would have a conversation, you have an easier time ranking this page for voice search. If you’re not sure what to put in an FAQ, go through customer calls and emails to see what they ask the most questions about. Not only is this document great for your voice search optimization, but it’s also a great reference document for self-service customer support purposes. You probably focus on long-tail keywords for some of your optimization already. Expand it for voice search. Questions and voice inquiries tend to be longer than typical keyword phrases. Incorporate all those longer, less competitive options for easier ranking. Take the time to look through your website traffic analytics and see what people are already searching for. Go beyond search engine phrases, and look at your on-site search as well. You’ll often find several phrases that fit perfectly into your voice search strategy. If you don’t already track this information on your website, start now. Google Analytics is an excellent free solution, especially if you use other Google services such as Google Adwords or Google Adsense. Voice search is commonly used to look up information on a smartphone while they’re driving around, looking for a business. A Google My Business listing gets your information in front of them at these important moments. It’s also great for local search optimization in general. Google and other search engines want to deliver information that’s capable of answering the questions posed by voice searchers. Structured data is highly organized and is searched easily by search engine algorithms. It gives Google standardized clues as to what the content on the page is about. When you use structured data on your website, you give the search engines additional context about the content you have. Together these tips can help you shift, adjust, and optimize the new reality of voice search on the web!